It is easy – just follow the link below, enter your location, and it gives you his/her email, website, and blog! Do it! They always answer. Occupied Palestine – PACBI learned today from its Steering Committee member, Dr. Haidar Eid, that the headquarters of the University Teachers Association-Palestine, in Gaza, was bombed by the Israeli occupation forces during their indiscriminate, willful destruction campaign in the Tal el-Hawa neighborhood of Gaza City on Friday. This latest wanton attack on an academic organization is far from being an exception. It is only the latest episode in what Oxford University academic Karma Nabulsi has termed “scholasticide,” or Israel’s systematic and intentional destruction of Palestinian education centers. In its current war on Gaza alone, Israel has bombed the ministry of education, the Islamic University of Gaza, and tens of schools, including at least 4 UNRWA schools, after having largely destroyed the infrastructure of teaching throughout the year and a half of its illegal and criminal siege of the densely populated Gaza Strip. The UTA headquarters is a detached two-story building that is clearly marked with the Association’s name. The bombed structure, which now stands without a roof, has sustained heavy structural damage and may be in danger of collapsing any time. Start a blog or website! 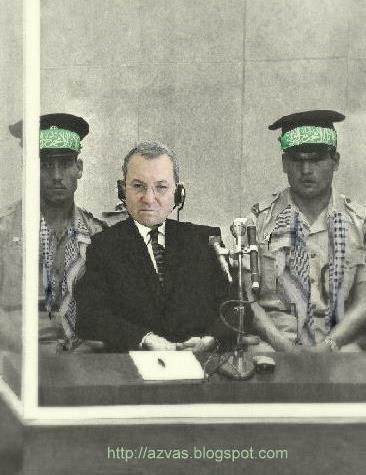 Will Barak Follow in Eichmann’s Footsteps? Oy, so many wild dreams I’ve been having these days, probably because of this war against the mishuggah hamasniks. Last night, my dream was set in the future, which is very strange because we, the Jewish people, usually fantasize solely about the past. Oi ever, this dream was set in something like 2020. Ehud’le Barak, Tzipi’le Livni, Shimon’le Peres and Ehud’le Olmert were seeking shelter overseas because of the War Crimes Tribunal. The mishuggenahs in the Hague were blaming them for crimes against humanity, can you believe this narishkeit? When all they did was to kill some arabs. In my dream, Barak was captured in NYC, schlepping refrigerators and sofas for an Israeli moving company. This is what many Israelis do in Americe once they finish their military service. This is a very funny blog, but its humour is razor-sharp and directed against the Zionist atrocities. Today, there was a bit of trouble at the counter-protest outside the Embassy (to the Nuremburg rally). At one point, I decided to get away. The police were walking behind me and for no reason, 2 or 3 of them started shoving me. It clearly didn’t bother them that I could have fallen over and been trampled on. I can’t remember if I tried to take a photo of them, but one of them later assaulted me. I had left my banner behind and so decided to hang around a bit to see if I could find it. For my own safety, I sat at the bus stop with another lady. Then, some policemen walked by, one of whom recognised me. He said, ‘You were at the demonstration!’ as if demonstrators aren’t allowed to sit at bus stops, yanked me out of my seat and started to push me! I don’t know what he was trying to do to me but he had no right to do that – and he was a big chap. Thankfully, a group of Muslims saw this and bundled over me to protect me from him. 2 other officers pulled him away. I then jumped up, ran towards him and took a photo. It may not have come out properly but he was one of the few black men there so I would probably recognise him. Thankfully, someone took his number (3407) so I will go to police complaints, and get legal advice. I intend to press charges for common assault. Pity I don’t have the details of the others but I can probably put in a general complaint. I did though, earlier on, meet a kind policemen who let me go back to get my rucksack which I had also left behind. One of them had said ‘tough’, but this one questioned, what was the harm me going back? There was no one around. Israel’s bloody brush [and in danger of increasing anti-Semitism]. Furthermore, how can Israel claim to be Jewish when it violates the Torah and not only desecrated the Jewish holiday of Chanukah, but also the Sabbath, when it lanched it’s air strikes on Saturday 27th December? [Bombarding] Attacking Gaza will not root out Hamas [and the loss of civilian life cannot be avoided in such a densely populated region]. Israel has no more right to [collectively] punish Palestinians with [state] terrorism for voting for Hamas than Hamas has the right to punish Israeli citizens for voting for their [racist, right-wing] government. Similarly, the Palestinians have the same right to defend themselvesas Israel – not that Israel’s operation is one of defence, but offence. This is no war but the ruthless oppression of refugees by one of the world’s most powerful, US-backed countries. Boycott: A list of brands to avoid! On the next link you can see a partial list of brands to avoid; when ata shop spotting one of those, don’t just avoid buying it, but tell the shop staff why you are doing this!